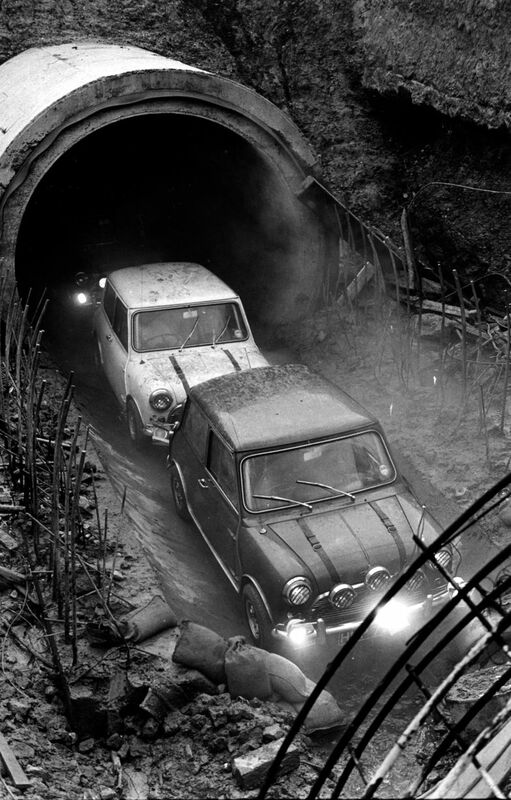 Chatting to a moke owner today, he reckoned his car had been used as a camera platform for the "sewer" film sequences. This was reported in the Coventry local papers at the time. 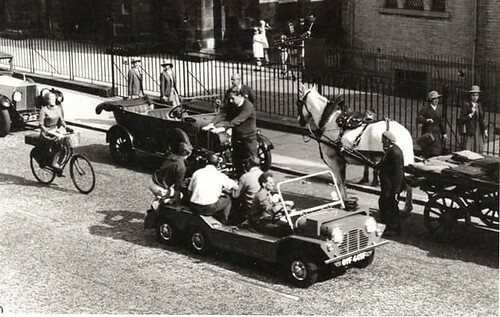 I think its true that a Moke was used as the camera car to shoot that scene. There's a 'making of' documentary that is one the DVD and a book as well called "Making of the Italian Job" by Matthew Field. It might have come from there. I think they were quite popular as camera cars, weren't they? Pandora - can you post up that picture for me ? This is interesting. 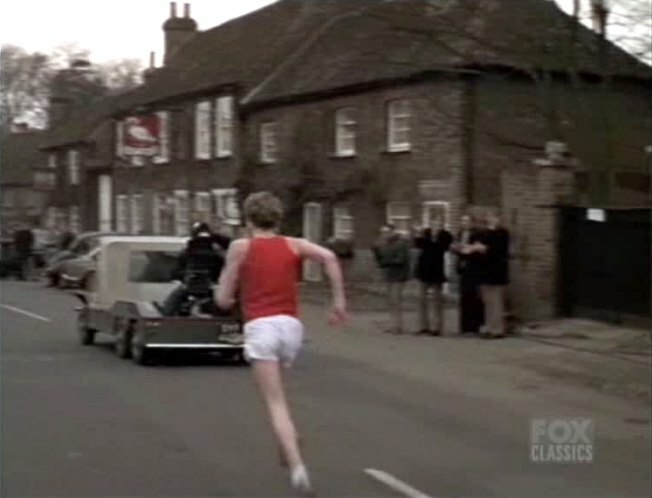 A Moke camera car, in a movie ("The Games", 1970) where it is filming a marathon. I wonder how many 6 wheeled Mokes there were in the film industry, or did someone make a fortune hiring out a couple to the entire industry? I watched that movie on TV yesterday. Some bits a little dated, but I enjoyed it. You know, I don't think I'd like to drive a moke through a sewer with the top down. Hi Tim. the Sewer only had water in it. They used it for the film just prior to the Sewer being commissioned, so the water would have been reasonably clean. I remember it all happening, as I grew up just outside Coventry. To paraphrase Neil from The Young Ones "Its a bit cloudy"
There's some more excellent pictures here, but no Mokes. This post was started asking about my Moke UPD 428F, the conversation would have taken place when I slipped onto the seafront parade of Mini Mokes at Brighton last year. I purchased the moke from Tony Theobald in 1996, who was involved with the production company that worked on The Italian Job, and he assured me that it was used to film. He kindly promised to supply me with the file he had on the car including some photos, but sadly this never happened. Since I bought the moke, it has been in storage, unused and unloved for 20 years, without giving it much thought! Until my daughter took an interest last year(although she isn't insured to drive it), a quick MOT and it was up and running, and we have since been running it to a few shows. We have since then tried to get hold of Tony, and unfortunately he passed away some years ago. The letter (attached hereto) is the only evidence I have of saying that it filmed the sewer scene, can anyone add anything further to its history??? Actually Macky, the conversation we had was at Tewin Classic Car day in August last year. Here's a picture of your car. But its great that you've had confirmation from Tony Theobald. Thank you for the pointer to the photo of Michael Caine and Benny Hill next to the milk float, a little internet searching allowed me to see it and I found a copy that was not so masked that just showed the final part of the number plate, tantalisingly just the last letter which was a "F". Tewin was a interesting day, I spoke to lots of interesting and knowledgeable people, one comment that arose was that my car had reinforcement under the front wing tops that was not standard. Leo Jack came to look at the Moke when I was considering him restoring it for me many years ago, I had already told him the story of the Italian Job and he pointed out drilled holes in the rear floor that were not there from the factory. Could this be for a camera mount? Supposition? Surely someone can either confirm this history or possibly dismiss it. Help please, any ideas gratefully received.